Original, quality 1920's / 30's oak fireside bellows with a cast brass spout and the woodwork decorated with brass and copper studs. All is complete and in superb working order with a serious puff. 20" x 6.5" x 2". Original, quality pair of pre-war oak fireside bellows with a cast brass spout and a carved panel to one side. 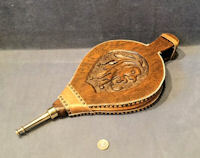 This pair of bellows have been fully overhauled and restored using replacement leather and brass studs and are now complete and in good and working order, with a good puff. 18" x 8.75" x 2.25". 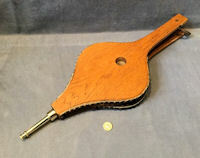 Original, quality pair of post-war fireside bellows in honey coloured oak with replacement leatherwork and brass studs. A great pair of bellows, complete and in good and working order with a polished brass and lacquered nozzle and a very good puff. 29" x 9" x 2.75". Original, quality pair of 1920's / 30's oak fireside bellows. 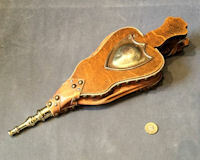 The leather and brass studs have all been replaced and all is now complete and in good and working order, with a great puff. 17" x 6" 2.5".